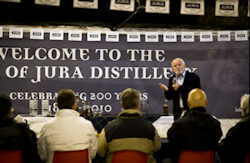 Fans of JURA single malt can relive the island’s recent two-day whisky festival thanks to the launch of an online tasting session and a festival highlights package, both hosted on www.isleofjura.com. Led by Willie Tait, Master Distiller, and Willie Cochrane, Distillery Manager, the tasting session offers those who were unable to attend the festival, a chance to savour a taste of the Feis Isle online and soak up the whisky wisdom of the knowledgeable duo. During the ten minute video, the two Willies guide viewersthrough thedistillery’s four classic bottlings – the 10-year-old, the 16-year-old, Superstition and Prophecy – lending their own brand of Hebridean humour to proceedings! Before watching the video, viewers are encouraged to download a tasting mat from www.isleofjura.com to guide them through the whisky flight. Visitors to the website can also watch a 7 minute Festival highlights package that takes viewers on a journey through the three hosted tasting sessions which took place on the island in May. In the first session, under the guidance of Master Distiller Willie Tait, viewers can join the visitors on their journey of the distillery’s core expressions, as well as a very special sampling of its commemorative 21-year-old. 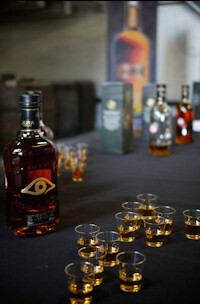 The second session shows visitors on a distillery tour with Distillery manager Willie Cochrane, during which they were invited to become a part of the distillery’s history by pouring a litre each into a cask and signing their names. In years to come, these fans can return to see the cask, knowing they were involved in making Jura whisky. The final tasting session captures Richard Paterson and visitors sampling from a very special cask which was created last year and released this year. Both videos are now available for viewing at www.isleofjura.com.